Customer segmentation is an art. In today’s world, the rules of marketing are in a state of constant flux. With each passing day there seems to be a new social media platform, another algorithm update, and a new “best practice,” and yet, even with all this change there are several trends that are here to stay. Today’s consumers aren’t only looking for a business that can provide them with the most information, the right services and the best rate – they’re looking for the businesses that are willing to treat them not as number, or a two dimensional customer, but as individual. That’s where customer segmentation, automated marketing and personalization come into play. It’s no secret that individualization and personalization help companies build trust and strong, long-lasting relationships with their customers, leads, and prospects. The real question then becomes: Is it possible for a business to grow and maintain a high level of personalized customer engagement? Learn how with this FREE eBook, The Power of Customer Segmentation, Automated Marketing and Personalization, written by Josías De La Espada, Sezion’s CEO. eBooks, Marketing tips, Resources automated marketing, customer segementation, free ebook, marketing automation, marketing personalization, personalization. permalink. 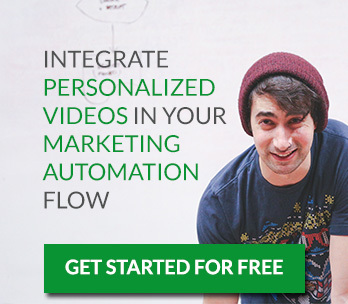 What’s The Best Personalized Video For Your Prospects, Leads and Customers?